Russian motifs and patterns can be frequently seen in the collections of Valentino, Dolce & Gabanna, Ralph Lauren and others among the world’s most acclaimed fashion designers. But let’s see what contemporary designers among some of Russia's many other nationalities are creating. To create conservative outfits that match strict Muslim rules, Bareeva uses minimalism, restrained color palette and avant-garde forms. At the same time, her unusual cut and variety of fabrics and textures give her clothes a fancy feeling. Vantazova creates dresses from the traditional fabric of nomads from Buryatia in south Siberia - sheep wool that's made into felt (traditional valenki boots are made with this material). Vantazova decorates those incredibly warm caftans with Buddhist ornaments. This brand has returned to its roots, reviving trendy embroidery and recreating it in a folksy way. They have both traditional and contemporary types of clothes and styles: from the woman's caftan-suit and blouse, to aprons and long vests. All items are generously decorated with fairy tale patterns. After spending most of her life in Paris, Masha has returned to Russia and creates with themes inspired by nature, ancient Rus and peasant life. She uses only natural fabrics: linen, cotton, wool, silk and ancient cuts on which to model her design. Probably the most famous designer in our list, Zaitsev is popularizing Russian motifs on the world’s fashion shows. In July, he presented a ‘Russian collection’ as part of the Oriental fashion show in Paris. His haut couture dresses are bright and often predominantly red. The Republic of Chechnya likes glitter, gold and fancy style. As founder of this brand, Aishat Kadyrova creates both classic long dresses for Muslim women with traditional ornaments and allusions to the local natural beauty. At the same time there are more casual trendy options in the region. Based in the World Cup host city of Samara, Levsha features prints of Russia-themed, Cyrillic lettering and free-cut long dresses in ancient Russian style. The studio has also created a collection devoted to outer space (one of the city's main sites is the Cosmos Museum). 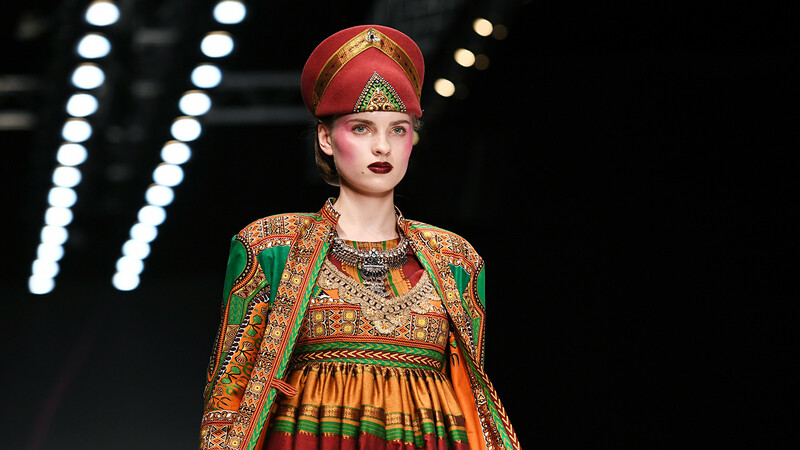 An interest in national roots brought Perm-based Vera Mekhonoshina to ethnic fashion. She focuses on everyday casual dress: her sarafans are long sundresses made from natural fabrics that are perfect for open air activities. Sultan creates dresses for major events such as the Miss Tatarstan beauty contest, or meetings with official delegations. What he likes most is modernizing the national costume so that Tatars can wear them everyday just like Central Asians. Nizie's design is not about fashion, but about searching for individuality. In July, she won a Grand Prix in the “Ethno Podium” contest. Her folklore designs of the Crimean Tatars mix ethnic allure, constructivist lines and contemporary coloring decisions and fabrics.